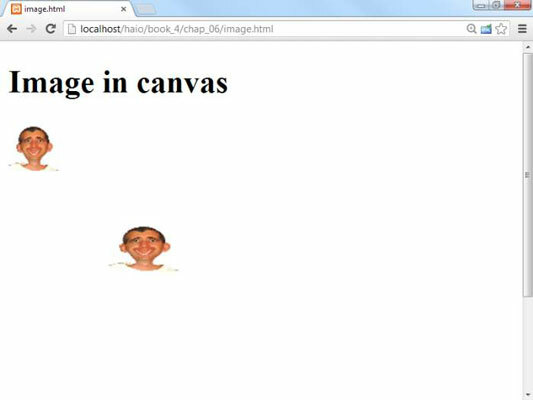 The easiest way to use an image in a <canvas> element is to use an image that is already available on the web page. You can put an image on the page with the ordinary <img> tag and use the CSS display: none rule to make the image invisible. 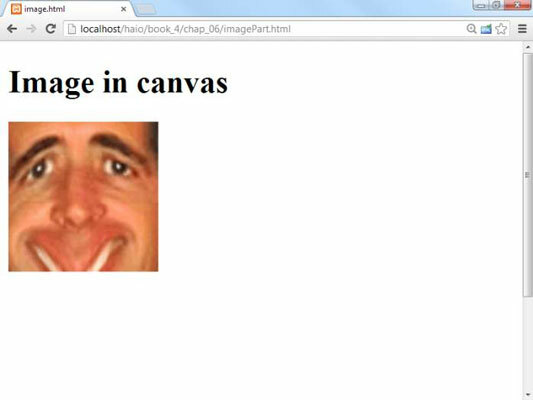 Create the image in the main page. The easiest way to access an image is to use ordinary HTML to embed the image in the main page. If you wish, you can hide the <img> tag with CSS code so that only the version in the canvas is visible. Use the ordinary document.getElementById() mechanism to create a variable referring to the image. Draw the image on the canvas. The image won’t display until it has loaded from the server. In most cases, this won’t be a problem, but sometimes you’ll find you need to delay your program until the image has finished loading. The image object has an onload property that accepts a callback function. Use this technique to wait until your drawing finishes. Height and width of source: The next two parameters indicate the height and width of the source selection. Position of destination: The next two parameters are the position of the picture’s top left corner on the canvas. Size of destination: The last two parameters describe the size of the destination image on the canvas. The “draw only part of an image” technique described here is quite useful because it allows you to combine several images into a single image (sometimes called a sprite sheet). This decreases the overhead for delivering the image. It’s also frequently used in games and animations where one entity might have several images displayed in sequence to suggest walking or attacking.